Should you stay or should you go? How do you know when a teaching situation has become toxic, and how do you know when it’s time to move on? 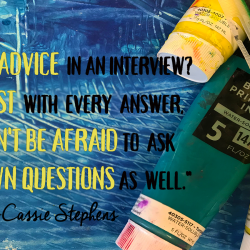 In this episode, Cassie talks about deciding whether you are in the right environment, how to deal with colleagues and administration, and why you need to always be open to a new opportunity. Full episode transcript below. Cassie: Y’all want to know what one of my biggest art teacherin’ pet peeves is? You don’t really have an option to say yes or no because I’m going to share it with you anyway. And I’m not talking about pet peeves that we have as art teachers. I’m talking a pet peeve of something that other art teachers do that drives me bananas. Usually, when we go to our fall conferences, we’re surrounded by other art teachers and that’s usually when I hear it. It’s usually at one of those sessions where the instructor who is probably trying to kill a little bit of time under the guise of let’s get to know each other does that awkward thing where everybody has to go around the room and introduce themselves and there’s always a few people that when it is their turn, okay this is actually two pet peeves, A, they talk for 20 minutes and then B, all they are is a Debbie Downer. We hear about how bad their teaching situation is. Their class sizes are huge. They have no planning time. They have no budget. And look, I’m not downplaying that all of those things are bad. But what drives me nuts is this: your teaching position, your school that you are at right now, that is not a life sentence. There are literally schools everywhere. And I just always want to stand up and scream, “Find a new school.” Just go for it. Just look for a new place. Any place that’s better than this miserable dungeon of a joint that you’re describing. Because sometimes we art teachers, we have to ask ourselves, should I stay or should I go? Thank you The Clash, you’re the best. I’m Cassie Stephens, and this is Everyday Art Room. I have in my 20 years of teaching had two times in my teaching career where I had to ask myself: Should I stay or should I go? One time the answer was go, the other time the answer was stay. And when I am considering should I stay or should I go, I’m talking about your teaching environment. In my mind, there are two elements to a teaching environment. There’s the physical elemental and then there’s the emotional element. The physical element is your actual teaching space. Do you have an art room? Is it an actual art room with a functioning sink? Does it have a kiln? Do you have the financial and budget wise resources to actually do what’s required of you? Is it a pleasant physical space for you to give your kids the best art experience possible? I mean I’m not talking about Disneyland, I’m just talking about do you have an art room that actually functions as an art room? That’s the physical aspect of your teaching environment. And then let’s talk emotionally. Are you in a place where everybody that you work with is close to everybody? Is there with the main goal in mind which is to educate children? They come every day to make sure those kids get the best that on that particular day you are able to give? Or are you working in an environment where the teachers, faculty, and staff are possibly more focused on toxic behaviors, gossiping, mean girl kind of mentality? That’s the kind of physical and emotional environments that make up your teaching environment. And when one or the other or both are no bueno, then it’s time to really start thinking about leaving that situation. All right. So I’m gonna take you back to the first time that I said go, which is actually the only time. I’ve only ever taught at two schools in my 20 years. And it happened to me at my fall state conference. This was probably back about 17 years ago. And by the way, side note, if you have never attended your fall state conference, or whenever your state does their art ed conference. If you’ve never attended, I cannot recommend going enough. Your state educators, art education association conference is going to give you a chance to be around people who get you. Surround yourself with people who do exactly what you do every day. Take sessions, meet vendors, make, make, make. If you have no idea how to find out about your state conference, you can google the name of your state and art education association. Definitely go every time that you have the opportunity to do so. You won’t regret it. So, at my very first time attending my Tennessee fall conference, they were doing that thing where you go around the room and introduce yourself. And that’s where I met a woman named Margo. Margo introduced herself and she said these words, “I teach at the best school and I have the best art room, and I’m retiring in two years.” And I was like, okay, Margo sounds a little braggy, but in two years time, if she really does work at the best school with the best room, I might be interested in getting to know her. Immediately after we introduced ourselves and we had a break, I buzzed over to Margo, gave her my information, exchanged, you know, got her information, set up a date for me to come and do an observation. So the reason I was so gung-ho to get to talk to Margo was because I was in a teaching situation at my current school where both the physical and the emotional environments were not good. No bueno. And I was ready to get out. Let me just paint a picture for you. The first two years of teaching for me, I taught in a portable, which is a trailer and it was outside of the school. That’s usually where they keep portables, duh, they don’t put them in the school. I could’ve been teaching on the other side of the universe as far as those teachers were concerned. They would dismiss the kids from the school door. They would never go up to my portable. And I was to dismiss them from my door and I never even went into the school. Part of that was my fault. I should’ve made more of an effort, but as a first-year teacher, I was taking my cues from those that I was surrounded by. And I was so very isolated and lonely. Especially as a person who’d never taught before. Legit had no clue what I was doing. And the nobody to really talk to about it. So my emotional state has always been a mess, but my emotional state, my teaching emotional state was not good. And of course, the classroom, the portable, it was fine. I didn’t no any better. But I did definitely long for the idea of having an actual bona fide sink where I didn’t have to take a water bucket back and forth to the school. I was there in that portable for two years before the school built a new building, and it was fabulous and amazing. And suddenly my physical environment became phenomenal. I had a huge storage closet, a kiln room with tons of shelves, a giant room, two sinks. It was a beautiful physical environment. And it was actually in the school building, so I was excited because I thought finally I’ll get to know my coworkers. They’ll actually know that my name is Ms. Stephens and not art lady, which is what I was routinely called. Anyway, after being in that place for a year, I was getting ready to go into summer vacation when my principal pulled me aside and said, “Look, our numbers are growing. Please do not get upset, but there’s a good chance you are not going to have this art room next year.” Please do not get upset, like what. If you’ve seen pictures of my art room on Instagram or on my blog, my art room is a stage for me to teach. It’s a definite environment and I’ve always created it that way. If we’re learning about Vincent Van Gogh, then I was painting and transforming the entire room into a Vincent Van Gogh style studio. If we were learning about Asia then the entire room became different parts of the countries of Asia. I mean I would spend my summers creating, decorating that room. Not that I recommend it, I just was kind of obsessed. It was my stage, my teaching tool. So for my principal to say, “Hey, FYI, you might not have this amazing tool that you kind of rely on to teach with.” I was pretty devastated. And not only that but despite the fact that I was actually in a building, I still was not able to connect with the other teachers. You know how it is, you either click with folks, or you don’t. And for some reason, I just couldn’t manage to find not a single friend. I couldn’t seem to click with anybody. So when I met Margo, I was ready to go. And I was ready to wait it out two years and even chance being on a cart. But if that meant that I was gonna end up in a different situation, I was ready. So that’s when I decided that it was a good time to go. Now, what happened you’re wondering? I literally stalked Margo for the next two years. I went to all of her art shows. I volunteered in her art room and I got to know the faculty and staff. When I sat down for that interview, I knew the principal, I knew the folks who were interviewing me, and they knew me. So it kind of helped a little bit. And the thing is when you do go to your state conferences, again this is a side note, or you are you know, just out in the world as it is. Always keep your eyes and ears open looking for opportunity. Again, your school is not your life sentence. If you are in a place right now that’s not worthy of you, then I encourage you to look elsewhere. I encourage you to put yourself out there. Now with social media, you can definitely be putting yourself out there. Show people what you’ve got. 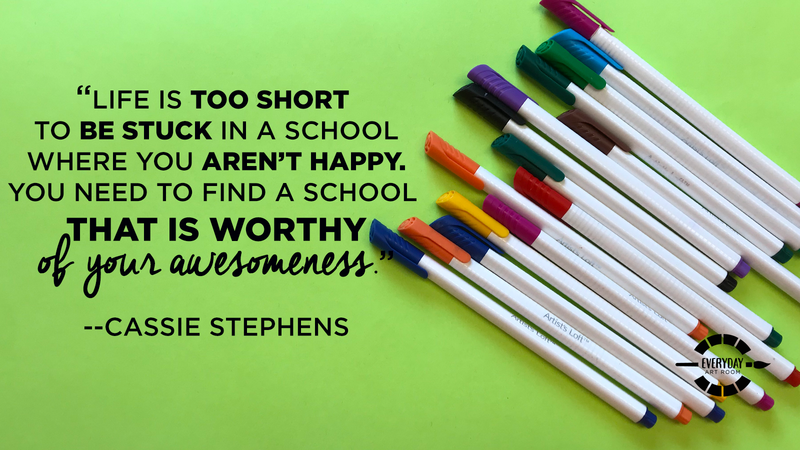 If you’re worthy of a great school with great support, you need to find that place that’s worthy of you. Okay. So now I get the gig, right? I landed the job and if you’ve seen pictures of my I call it my new art room, it’s not. I’ve been there for 15 years now. It’s a … Margo wasn’t fibbin’ y’all. It is a giant room. It used to be the school library before the school was remodeled. So it’s nice and long, lots of shelving. I don’t want to tell you how many storage closets. Now I’m sounding like a braggadocios Margo and I don’t want to do that. But I will say this when I got that job I was so thrilled with my teaching environment and I was so thrilled to finally make some emotional connections. I’m sad to say I didn’t. When I started at that school, there were a lot of people who had been there for a very long time. And there was definitely some cliques happening. And there was definitely some mean girl bullying situations happening. And the administration at that time almost seemed to fan those flames. It was not a very good emotional environment to be teaching in. And the only way I really found to deal with it, was staying in my happy physical environment with my happy little artists in my room. I had to decide is what’s happening outside my classroom right now, is this throwing people under the bus, saying hurtful things behind people’s backs, I mean y’all it was some pretty bad bullying. And I had to decide is this bad enough that I want to go? Is this affecting me? Is this something I want to get involved in? And all of those answers were no. I didn’t want to leave. I loved my school. I love my school. I didn’t want to be a part of any of that nonsense that I was witnessing. So my way to do that again was just kind of be in my own happy place. So when the question of should I stay or should I go came up the second time at my current school 10 years ago, the answer to that question for me was no. I’m going to stay. I’m going to ride this out and hope that things change. And you know what? 10 years later, I have an administration that is so stinkin’ supportive. It’s kind of bananas. I have coworkers that I love. And I have a team, I feel like I’m getting emotional, I have a special areas team that I really enjoy spending time with and teaching alongside. And I’m really proud that I decided to stay because I feel like now the environment at my school is the focus is on the kids. And that’s where it needs to be. If you find yourself in a place where it isn’t, you might want to decide, is this enough of a hurdle that I can go over and carry this weight of making the kids my focus alone, or do I need that emotional support and this around me is just too damaging to my emotional state that I need to get out? Again, your situation isn’t your life sentence. Don’t put a nail in your coffin and don’t say my budget stinks, my coworkers are miserable, my room is terrible, I’m on a cart and I just don’t love it. Start looking for a way out. Sometimes it even gets a little uncomfortable because you might even have to give the thought of moving. That might have to come into play. Making a change is hard. But do you know what’s harder? Being miserable. And if you’re not happy right now, are you going to be happy complaining about it and not doing anything about it? I kind of doubt it. I want to say the next time you’re in a meeting and everybody’s doing that thing where they’re going around and introducing themselves, and you get ready. In fact, you can just pretend to say it right now, “Hi, my name is. I teach at. And I am happy that I teach there,” or, “I’m not.” And I’m not and here’s what I’m going to do about it. All right. Have I convinced you? Go for it. And definitely go to your fall conference, so you can meet your very own Margo. But it’s not gonna be me, ’cause I’m not giving up my art room. Tim: Hello. This is Tim Bogatz, the host of Art Ed Radio. 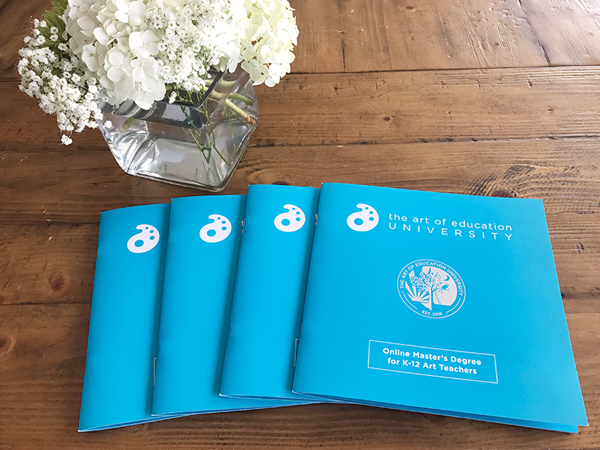 Today I want to talk to you about Art Ed PRO. If you were looking to consistently get better at a teacher, PRO is the professional development service that you need. The library is filled with on-demand video tutorials, downloadable handouts, and all kinds of other resources to help take your teaching to the next level. In fact, three new learning packs are coming out today. Basic Wheel Throwing, Exploring Architecture through Paper Sculpture, and teaching in a Title I school from AOE writer Wynita Harmon. The library now has nearly 90 Learning Packs, which should cover just about everything you need when it comes to teaching art. If you haven’t tried it, you can get a 30-day trial for free and you can see how amazing it is, if you give it a try. It’s at theartofed.com/pro. Now let me give the episode back to Cassie, as she opens up the mail bag. Cassie: And now it’s time to take a little dip into the mail bag. This question comes from Meredith. She says, “I would love to pick your brain about teaching needle felting with 20 plus kids.” All right. Really, Meredith, it depends on the age of the kids. And how trustworthy these kiddos or you know responsible these kiddos are. When you’re doing needle felting, the danger is with that actual needle. It’s razor sharp and it’s serrated. So if you even just gently tap yourself with a needle felting tool, there will be blood. And I’m not talking about a tiny little drop. I’m talking spurting blood. I don’t know what it is, but every time somebody injures themselves in a needle felting class I’m doing, with adults mind you, there’s always blood. In fact, it’s so funny, I always order my needle felting kits, get ready to write this down, from Sue Bunch at Back to Back Fiber and every … she’s amazing. You can reach out to her if you’re interested in getting a class kit. I’m almost positive she also sells the kits through Nasco. And she always includes a little band aid and a little alcohol wipe in all of her kits because she knows there will be blood. So if you’re going to do it with 20 plus kids, here’s my suggestion. I would not do needle felting with kids younger than fourth grade. I definitely would encourage you to get some volunteers, parent volunteers, maybe one per every five kids. That way they can just kind of hover and helicopter over a table. Just to make sure the kids are keeping their eyes on their needle felting. That’s the key. They have to be looking at what they’re doing the whole time. Not only that, but Sue also includes a wooden skewer in her needle felting kits. If you are buying the supplies on your own, I would strongly encourage you to get some wooden skewers. What the skewers are for is for you to, with your non dominant hand, just hold down the roving while your dominant hand is stabbing the roving with the needle felting tool. If it sounds like I’m speaking a completely different language, then you should probably check out my podcast episode All About Needle Felting. Or hop over to my blog or my YouTube channel. I’ve got loads more information on needle felting. But Meredith, that’s what I would suggest. Definitely, have some parent volunteers on hand. Make sure you’re doing this with students who understand how dangerous it is to work with a needle felting tool and how they have to pay close attention. Have band aids on hand, and also make sure that you have them use a wooden skewer. If they’re using the wooden skewer to hold down the roving, there shouldn’t be any issues with them getting poked with a needle felting tool. Great question. This next one comes from Andrea, and she says, she has a question about the Sandra Silberzweig portraits that my third graders are currently doing. I have a video lesson on this on my YouTube channel. And they are beautiful abstract portraits that are created on black construction paper with black glue. And so she’s got two questions. Is there a downside to using white Elmer’s glue on the black background? So, gosh, when I do this portrait, I have to mix up black glue. I hate making black glue. It never seems to come out correctly. So if you’re not familiar with black glue, it’s a glue that you’ve added, I always add ink to, or you could add black tempera paint to. When you add the ink, I have noticed it does this weird transformation into kind of a slime substance which then when it comes out of the bottle clogs the bottle and you guys, you know how unfun a clogged glue bottle is. So there’s that. And if you mix it with the tempera paint, well something about it, it just wasn’t turning out quite right. And somebody recently just shared with me that one of the major art supply catalogs is now selling black glue. I’m sure it’s one million trillion dollars. But again, take my money. I don’t like making the stuff anyway. Her other question for me is what size paper do I use for this project? We use 9 by 12 black construction paper. The reason we use that smaller size is because we do those portraits for our Artome, A R T O M E, Artome art shows, which is the company that double mats and frames your artwork and comes to your school and puts on an art show. It’s pretty amazing. And that’s the size of their frames. If I were going to do this without the idea of a frame in mind, I think that doubling that size, making it 12 by 18 would also be really beautiful and kind of like a show stopper because they would be huge. But it really depends on you know your students. You know if they’re gonna really be into working on a chalk picture that’s that large or they’re maybe gonna prefer something a little smaller. My kids, they definitely like it a little smaller. It’s interesting. Recently I’ve had at least two kids say to me that they really don’t enjoy using chalk because they don’t love the sound of the chalk on the paper. And I used to dismiss that like oh stop, you’re being crazy. And I understand it now. We’re all different. There are some things that are nails on a chalkboard, or in this case, nails on construction paper, or chalk on construction paper. And I get it. So where was, I don’t know where I was going with that. But anyway, we do it on a smaller scale, and I hope that helps. If you have questions for me, you should send them my way. 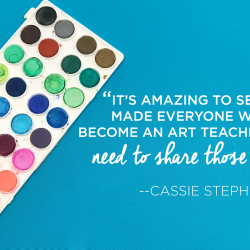 You can find me at the Everyday Art Room at artofed.com. I was in my art ed classes, something they always told us when you get that first job it doesn’t matter how bad that job is, you need to stick it out for three years because it looks really bad if you bounce from one job to another. Y’all three years? That’s a long time. And life’s too short to be stuck in a stinky school that you’re not happy in. One that just isn’t worthy of your awesomeness. So some of those rules, I feel like that we’re taught in school, or that the quote grown ups in our life tell us, toss ’em aside. Take it with a grain of salt, and then you can toss it aside. Same with my advice too. You know your school situation, you don’t have to stay there if you’re not happy. And if you are happy, like how I am, then stay as long as you want. I have students who come back and they’re like, “I can’t believe you’re still here.” First of all, thanks for that. Secondly, why would I leave? It’s such an awesome place. And the kids, they ain’t too shabby either. Thank you guys for letting me share. Have a great week. The post was strikingly helpful for me, administrator. Your association aptitudes are unbelievably demonstrate and what’s more I valued the experience of examining the post of yours. I will in all actuality share this post. unprecedented achievement!! I find this mildly frustrating. I live in small area Mississippi and relocation is not an option. Art jobs are scarce here. I’m driving 40 minutes for mine. It’s not the physical space that’s bad, its the emotional and behavioral issues that are. And the answer is I should go but there is no where to go, and I’ve looked. It’s not a “Oh, I can wait this out a bit and watch for something better” situation. It’s a things are dangerous sometimes and I can’t stay much longer situation. And it’s really offensive that you think everyone just isn’t looking hard enough or willing to move to get that better job. Sometimes, it’s just not feasible. I completely agree with everything you have said. This wasn’t helpful advise, since many of us are not in the position to find another art teaching job on a whim. My current question of “do I stay or do I go”, has to do with how my current job is impacting my mental health, not wanting to abandon my students, and fear about finding another position. Not such and easy question to answer. I want to echo this; as someone who has been in a classroom for 21 years with a BFA, MFA and CAGS, the only way I’m going to be able to “go” from a poor morale situation is to take a MASSIVE pay cut or to jump to administration in another district. I want to stay in the classroom and tbh, my experience and knowledge just isn’t valued when they see the price tag attached. 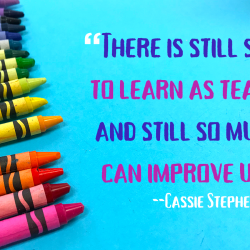 Hey Cassie – just wanted to drop a line from a different perspective to say how much I appreciated and needed this post. My current situation involves traveling and teaching without a classroom several days a week in a shared cafeteria with no sink, no storage, and a crazy schedule. Affirmation that it is okay to want and better is really what I needed. Thanks! I also wanted to say that I needed to hear this, and it has inspired me to get proactive about finding a better teaching situation for myself.